Shortly after Enlightenment, the Buddha said: “I shall not come to my final passing away, until my bhikkhus and bhikkhunis, laymen and laywomen, have come to be true disciples… ” Even though the Buddha established the bhikkhunī monastery, the line of female ordination in the Theravāda tradition died out in the 11th century. Since then, it is believed that nuns can no longer be ordained. 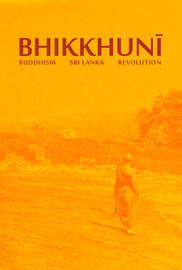 The documentary, “Bhikkhunī – Buddhism, Sri Lanka, Revolution”, presents the story of women, who in order to implement the Buddha’s teachings, however against the opinion of the monks’ Saṅgha, have become fully ordained bhikkhunīs – Buddhist nuns in the Theravāda tradition. The film’s protagonists are Bhikkhunī Kusuma (ordained in 1996), Bhikkhunī Dhammananda (ordained in 2003) and Bhikkhunī Gautami (ordained in 2016) – the first women in their countries’ modern history to become fully ordained nuns.